You must complete 18 hours of in-service training in order to maintain current certification. These courses must be approved by the MD Police and Correctional Training Commissions. If there is not a C# associated with the course - it is not certified. You are responsible for making sure the courses you take are compliant. If you have any doubt please contact the Parole and Probation Training Unit, dlpctcdpptraining_dpscs@maryland.gov. Classes must be registered online at https://training.mdle.net by a supervisor. A valid email and an employee certification number are required to register. Employees must make all training requests through their immediate supervisors via email. If an employee must cancel, they must do so through their immediate supervisor at the earliest possible date. If you have trouble registering please contact the Parole and Probation Training Unit at dlpctcdpptraining_dpscs@maryland.gov. Agent Academy: Academy classes are held unless State Government Offices are closed. In-Service: Classes will be held unless State Government Offices are closed. If you are attending a course that is being held at any of the Community College of Baltimore County (CCBC) locations (Hunt Valley, Owings Mills, Randallstown, etc. ), please follow the college's inclement weather policy. You may check online ( www.ccbcmd.edu), local TV or radio stations. If the college opens 2 hours late (10:00 a.m.) due to weather, classes will start at 10:00 a.m.
All classes that have been certified by MPCTC will have a written examination comprised of True/False, Multiple Choice, Essay and/or a Performance Test in which the participant must demonstrate proficiency in a skilled area. Participants must achieve a score of 75% on written examinations and/or be rated satisfactorily in all areas to pass a performance test. A participant needs to be present for the entire class in order to take the test. Cheating is prohibited. Unless otherwise stated, Level 1 or Level 2 dress code is required for all training classes. Cell phones are not permitted during training. In case of an emergency please contact front desk at 410-875-3400, or Lisa Wilson at 410-875-3574. Arriving late to training is very disruptive to the class. Late participants will not be permitted into class. Disruptive and/ or disrespectful behavior will not be tolerated. Anyone unable to act professionally during training will be removed from the class and receive a failing grade. One hour of in-service training is available on the MPCTC E-Learning Portal. DPP personnel are only permitted to take the OC Spray module and not the other listed courses, as they are not approved for hours. Read the "First Time Here" instructions carefully on the portal homepage. As of January 1, 2015: You will not be permitted to take the same on-line training two years in a row. For example, if you took Elder Abuse in 2014 you will not be able to take it again until 2016 to receive credit hours. You must take the Parole & Probation test to receive credit! Tests can be found on the Parole & Probation Testing Module. You must score at least 80% to pass. HUB training is not approved for in-service hours. 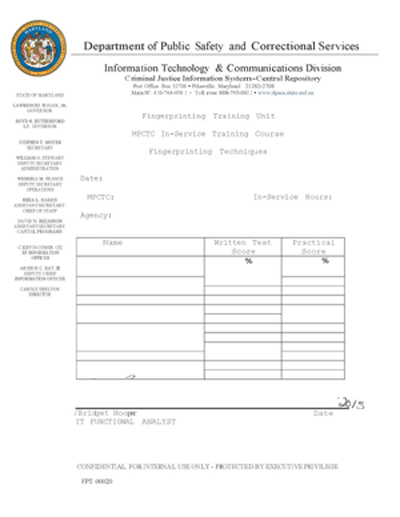 HUB training is necessary for and relating to employment purposes; not for specific skills related to obtaining and retraining MPCTC Agent Certification. If you attend an outside training, you are required to request documentation confirming your successful completion of the course. This includes CN5, Fingerprinting, training offered by Sherriff?s office, etc.Before attending training for in-service hours, please make sure it is certified by MPCTC! This course is designed to give agents a refresher on tools to successfully complete the Level of Service Inventory-Revised (LSI-R). This is an evidence based program provided by the Crime and Justice Institute, designed to assist staff in developing and utilizing a variety of rewards and interventions for offenders. These rewards and interventions are a critical component in accountability and changing behavior. Lethality Assessment Program-Maryland Model (LAP) was created by the Maryland Network Against Domestic Violence (MNADV) and is currently being used by Maryland law enforcement agencies, hospitals and law enforcement in other states. This course will give the student an understanding of how LAP is an evidence-based approach to homicide prevention. Students will be able to understand how to utilize the LAP protocol and develop the skills necessary to effectively assist case workers, advocate staff and first responders on completing the LAP, and how it relates to the General Order 10-002 on Domestic Violence, per DPP Policy. This course will also define domestic violence and explore dynamics and types of abuse, with specifics involving intimate partner violence; review and understand DPP General 10-002 on Domestic Violence. DPP Mandatory in-service will cover required topics such as sexual harassment, pathogens, and the Justice Reinvestment Act. Please note: There are separate classes for each employee classification, noted below in the “Class Description.” If you are not signed up for the correct type, you will not be permitted to remain in class. All DPP staff is required to attend one of the dates appropriate for the classification. Various Approval Codes: C16246, JRA Refresher, 3 hours / C16247, Pathogens, 1 hour / C16248, Sexual Harassment, 2 hours All registrations MUST include the student’s rank/title/classification in the RANK FIELD upon requesting enrollment. Failure to provide this information will result in automatic DENIAL of enrollment. If applicable, students must also provide the 6-digit certification number upon enrollment. This is the number on your MPCTC-issued certification card (NOT the number on the State ID badge). DPP Mandatory in-service will cover required topics such as sexual harassment, pathogens, and the Justice Reinvestment Act. Please note: There are separate classes for each employee classification, noted below in the “Class Description.” If you are not signed up for the correct type, you will not be permitted to remain in class. All DPP staff is required to attend one of the dates appropriate for the classification. Various Approval Codes: C16247, Pathogens, 1 hour / C16248, Sexual Harassment, 2 hours All registrations MUST include the student’s rank/title/classification in the RANK FIELD upon requesting enrollment. Failure to provide this information will result in automatic DENIAL of enrollment. If applicable, students must also provide the 6-digit certification number upon enrollment. This is the number on your MPCTC-issued certification card (NOT the number on the State ID badge). Audience: DPP Personnel Only This course teaches participants a five-step action plan to assess a situation, select and implement interventions and secure appropriate care for the individual. The certification program introduces participants to risk factors and warning signs of mental health problems, builds understanding of their impact and overviews common treatments. The majority of people who have behavioral health issues and are involved with the justice system have significant histories of trauma and exposure to personal and community violence. Trauma-informed care is an approach used to engage people with histories of trauma. It recognizes the presence of trauma symptoms and acknowledges the role that trauma can play in people’s lives. Trauma-informed criminal justice responses can help to avoid re-traumatizing individuals. This increases safety for all, decreases the chance of an individual returning to criminal behavior, and supports the recovery of justice-involved women and men with serious mental illness. Partnerships across systems can also help link individuals to trauma-informed services and treatment. During this refresher to the "Fines, Costs, and Restitution" training, students will review policy regarding collection of funds, recognize ongoing responsibilities each employee has to this obligation, and discuss possible solutions to difficult cases. This course will give students information on what a gang is, how to identify them, and how to effectively handle a suspected gang member. This course was developed as in-service for Parole & Probation agents. This course will review pathogens, ways to protect ourselves from exposure, and the steps to take if exposed. In addition, it will discuss bleeding control basics. Students will be able to identify life threatening bleeding, and ways to prevent a loss of life. One of the most common causes of preventable death after traumatic injury is uncontrolled bleeding. Participants will be required to perform practical exercises for bleeding control. This course is designed to teach you how to recognize and control life-threatening bleeding. We can’t do that without clinical photographs/videos that are relevant to the course content. Some of these information is graphic in nature and may be disturbing to some individuals. This course will provide non-custody staff with the confidence to initiate Defensive Tactics techniques in the event that staff are forced to protect themselves from physical harm. Safe ASIST is a two day interactive workshop in suicide first -aid. ASIST teaches participants to recognize when someone may be at risk of suicide and work with them to create a plan that will support their immediate safety. ASIST helps participants become more willing, ready and able to intervene with someone at risk of suicide.